Bernard Simms Spalding was born on 2 March 1905 at Washington, District of Columbia. He was the son of Ignatius Simms Spalding and Mary Agnes Russell. Bernard Simms Spalding married Mary Agnes Montgomery, daughter of Charles Jerome Montgomery and Mary Louise Force, on 11 January 1923 at Baltimore Cathedral, Baltimore, Maryland. Bernard Simms Spalding ended military service on 15 December 1945 at United States Naval Training Center, Bainbridge, Port Deposit, Cecil County, Maryland. 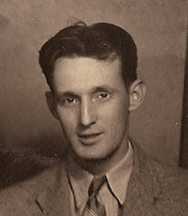 Bernard Simms Spalding died on 13 March 1971 at Shannon Airport, County Clare, Ireland, at age 66. He was buried on 18 March 1971 at Fort Lincoln Cemetery, Brentwood, Prince Georges, Maryland.